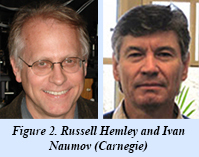 New work from Carnegie's Ivan Naumov and Russell Hemley delves into the chemistry underlying some surprising recent observations about hydrogen and reveals remarkable parallels between hydrogen and graphene under extreme pressures. 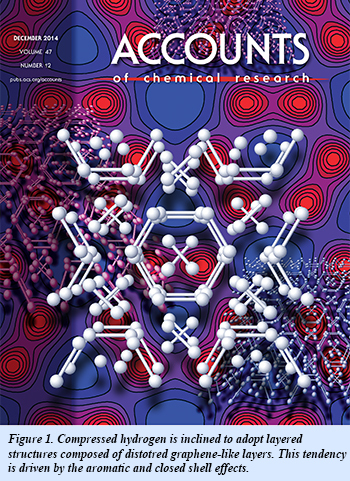 Their work is the cover story in the December issue of Accounts of Chemical Research. Hydrogen is the most abundant element in the cosmos. With only a single electron per atom, it is deceptively simple. As a result, hydrogen has been a testing ground for theories of the chemical bond since the birth of quantum mechanics a century ago. Understanding the nature of chemical bonding in extreme environments is crucial for expanding our understanding of matter over the broad range of conditions found in the universe. Though the discovery of the graphene character of dense hydrogen has come as a surprise to many, chemists thirty years ago – before the discovery of graphene – predicted the structure based on simple chemical considerations. Their work is validated and extended by new findings. The group's results indicate that chemical bonding occurs over a much broader range of conditions than people had previously considered. However, the structural effects of that chemical bonding under conditions can be very different than that observed under the ordinary conditions that are familiar to us [I. Naumov and R. J. Hemley, Acc. Chem. Res., dx.doi.org/10.1021/ar5002654 (2014)].